Little Dipper’s Italian Ice is a mobile food cart that serves homemade Italian ice. 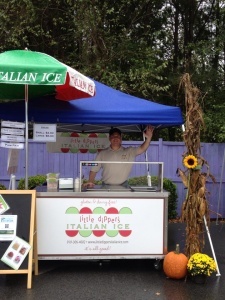 We make our Italian ice right here in Pittsboro, NC using natural ingredients – local and fresh when possible! Little Dipper’s is available for your next event, big or small. We offer a variety of flavors, all of which are gluten and dairy free. A wonderfully refreshing alternative to ice cream on a hot summer day! Varies. Check our calendar for scheduled locations.